It’s all about spring now as winter is officially last season. The northern hemisphere is getting ready to come alive with a burst of greens, and we are already marvelling at blossom on trees. Pretty little carpets of flowers in city parks make us smile knowingly, and the sound of birdsong is calling us to fling open doors and windows to let the season rush in. The spring equinox came and went and the clocks sprang forward, reassuring us that the days are getting longer and the land will once again be light and awash with colour and new growth. 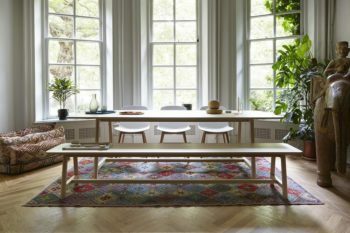 Whilst the new season tugs encouragingly at us to get outside, we can’t always oblige, and finding a balance of outdoor and indoor living can be hard when domesticity beckons and the office rules. 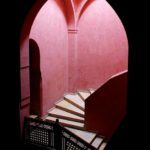 The solution for many is to bring the outside inside – which feels invigorating and inescapably healthy. 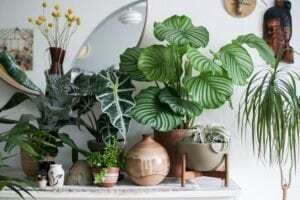 With its vivid shades of green painted on walls and furniture, nature is inspiring interiors more than ever and the majestic influences of temperate Victorian glasshouses are stealing their way into our homes. Green is very much the on-trend colour of the season and is being celebrated widely; most notably due to the December 2016 launch of Pantone’s colour of the year ‘Greenery’, which was declared ‘the universal shade of hope’. Pantone Color Institute executive director Leatrice Eiseman recently told the New York Times “We know what kind of world we are living in; one that is very stressful and very tense, this is the color of hopefulness, and of our connection to nature. It speaks to what we call the ‘re’ words; regenerate, refresh, revitalize, renew. Every spring we enter a new cycle and new shoots come from the ground. It is something life affirming to look forward to”. The passion for green to ground us in a world of unrest seems universal, so bringing it home makes perfect sense. Wallpapers and textiles featuring bold palms, delicate ferns and all manner of flora and fauna are in abundance. 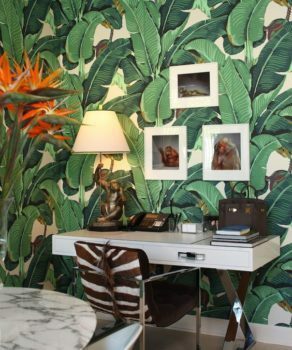 Inspiration is being drawn from retro wallpapers such as the the original Martinique Banana Leaf wallpaper, which was created by decorator Don Loper in 1942 for the Beverly Hills Hotel. 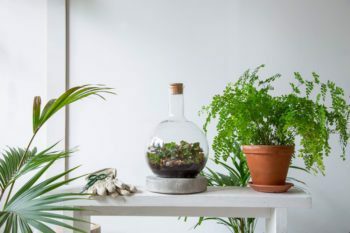 Garden centres, florists and regional flower markets are offering up easy to care for plants, and Terrariums are making a comeback – it’s fair to say that we are well-rooted in a new age of green living. Inspiration is coming directly to us from nature and we are bang on target within the perfect season to embrace it. 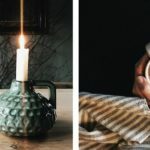 Interior magazines, style pages, Pinterest and the blogasphere are awash with fresh ideas to revive your senses; just tap the words ‘green’ and ‘interiors’ into any search engine and you’ll be hit with an explosion of brilliance. 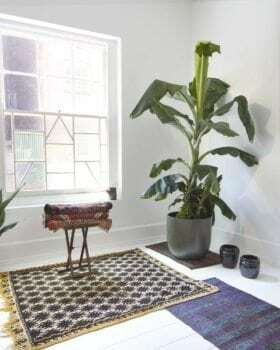 There are a multitude of ways to welcome green in to the home, whether organic or through a carefully planned scheme; but, as with all these projects, the key is in finding what works for you and your home. Spring cleaning can mean so much more than a good dust behind the wardrobe; playing with new paint colours, re-vamping rooms and getting furniture re-upholstered are all great seasonal activities. 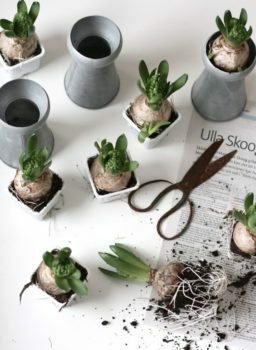 However, if you don’t feel you have the time or budget to go wild with pots of paint, there are plenty of potted plant options to breathe life in to your home. A simple fern or a bulb in a pot can harness some of the emerald goodness of nature, and if you really want to get inspired by a bounty of green then make a visit to one of the UK’s temperate hothouses – from the modern splendour of the Eden Project in Cornwall to the impressive Palm House at the Royal Botanic Gardens of Edinburgh. 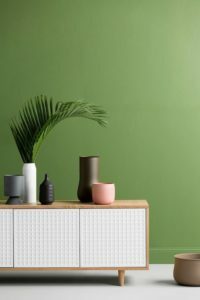 To help you find inspiration for your spring home here are a few links to point you in the right direction…..
Pantone’s Greenery is available at many paint suppliers, visit Pantone for a list of stockists. Some other paint suppliers with a good green colour palette are Little Green, Farrow & Ball and Dulux. There are some wonderful fern and palm print wallpapers available at Sanderson and Cole & Son. Learn how to make your own terranium with London Terraniums, who offer workshops for all. 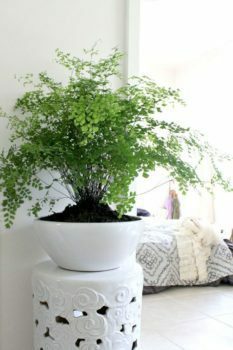 For indoor plant inspiration and regular commentary on the subject visit Urban Jungle Bloggers. For a great selection of small succulents visit Grace & Thorn in Hackney, London. Many large DIY stores stock large indoor palms, ferns and pots, visit Homebase for ideas. 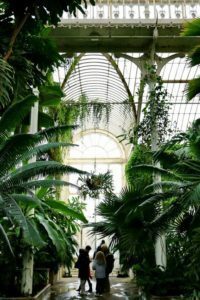 Visit Kew Gardens or the Royal Botanic Gardens of Edinburgh for impressive fern and succulent plant collections. Or venture to Cornwall’s Eden Project for a more modern take on things.